That is one pretty pumpkin and looks like it has the shape to be turned into a musical instrument! I love those and use them for all my baked treats (pumpkin pie, muffins, etc...). It is a potimarron (French) = Hokkaido Pumpkin = Chestnut Pumpkin = Baby Red Hubbard = Uchiki Kuri = Chinese Pumpkin = Japanese Pumpkin. I hope that helps. Thank you Soma. I couldn't put my finger on it but now that you mentioned it so true a musical instrument!! :) Thank you so much Rosa this is extremely helpful. 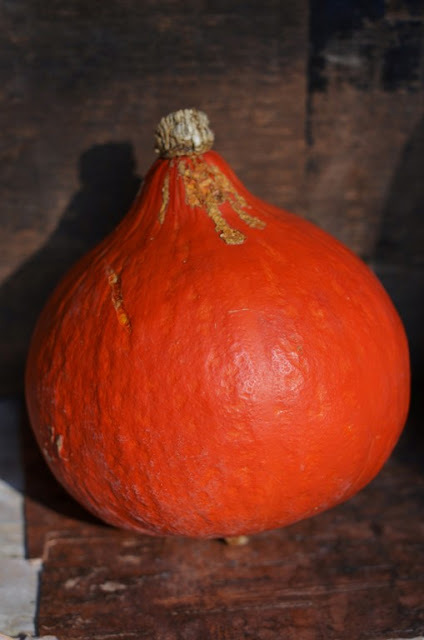 I haven't had a clue to the type of pumpkin and moreover, if this particular one is only decorative or suited for cooking. You've helped more than you can imagine! yes! a hokkaido pumpkin, indeed. I just made a very "fall" dish withs sweet potatoes, but you can certainly do it with roasted cubed pumpkin and I then sauteed apples with brown sugar and maple syrup; tossed the caramelized apples with the pumpkin cubes and done! Awesome side dish! M loved it! Love the tone in this picture... Shulie you have the ability to turn a ho-hum into a wow, and this photo is a proof to that. I recently made yema pumpkin balls. yema is a popular treat in the Philippines made of condensed milk... the experiment turned yumilicious haha.